The SIMCelt Data Portal is a demonstrator tool which aims to share transboundary MSP information from within the Celtic Seas region. The tool allows users to identify and explore gaps in data, prompting them to find possible solutions and support the data gathering phases of MSP. The Portal is one of a suite of outputs which forms an overall sub-component on “Data and Information Requirements for MSP”. What data is available to support planning in the Celtic seas? Where do gaps exist in data for the Celtic Seas? How can interactive tools for planning be designed? The implementation of Maritime Spatial Planning (MSP) requires high quality data as stated in Article 6 of the MSP Directive 2014/89/EU and as per Article 10 the sharing of this data should be decided upon in order to facilitate the production of maritime spatial plans. 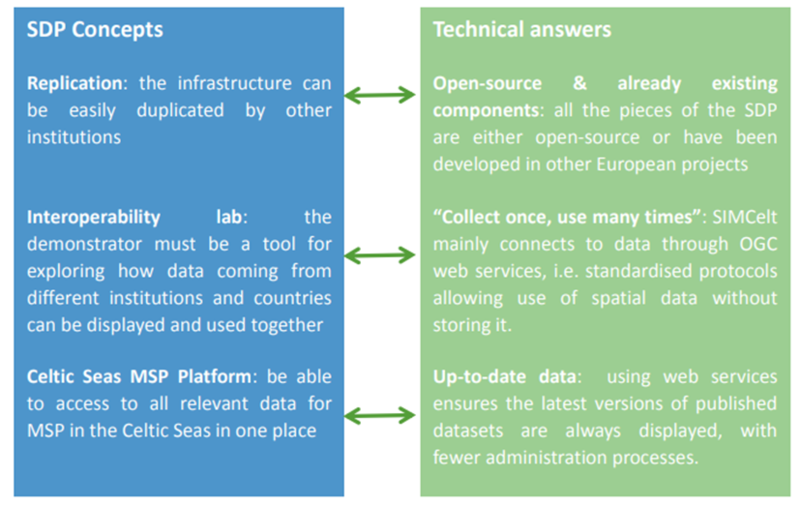 With regards to environmental data the INSPIRE Directive 2007/2/EC was established to create an Infrastructure for Spatial Information in the European Community and to ensure the spatial infrastructures of Member States are compatible and usable in a Community and transboundary context. MSP thus far has been able to take advantage of this knowledge exchange however gaps in data and information still remain and therefore the need to continue to improve spatial data sharing. Deliverable 7- Data Management Guidance Document. Part of the latter report outlines the need for and the workings off the SIMCelt Data Portal (SDP) Demonstrator which is summarised in the practice below. All stakeholders involved in the MSP to display and to use datasets in transboundary context. Due to the diverse nature of the target audience the portal is designed to be as user friendly as possible. Latest available data are always displayed, without any additional manipulation. The following figure explains the concepts developed by this portal demonstrator and the associated technical answers. Whist the portal itself focuses on the Celtic Seas it has been constructed in such way any organisation who wished to would be able to replicate it. This was achieved by using only components either under open-source licenses or already developed through other European projects.